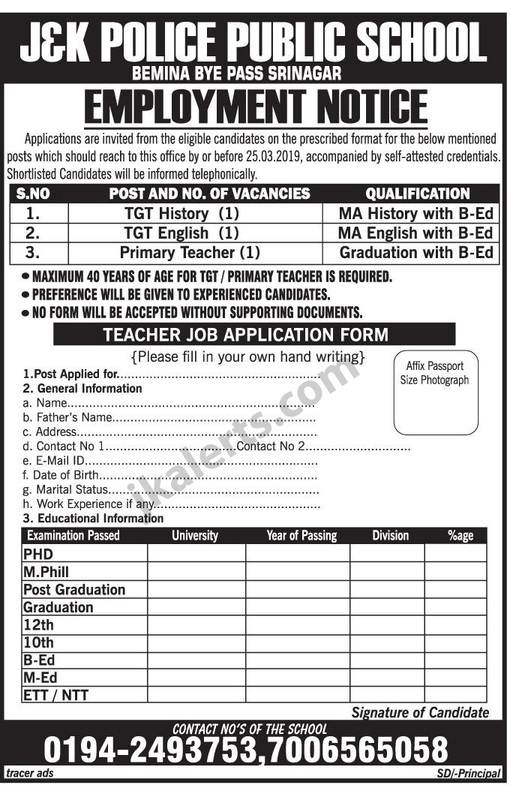 J&K Police Public School Srinagar Jobs Recruitment 2019. J&K Police School employment notification for various teaching posts. • MAXIMUM 40 YEARS OF AGE FOR TGT / PRIMARY TEACHER IS REQUIRED. • PREFERENCE WILL BE GIVEN TO EXPERIENCED CANDIDATES. • NO FORM WILL BE ACCEPTED WITHOUT SUPPORTING DOCUMENTS.